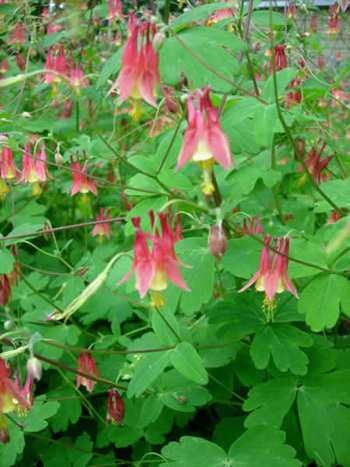 Columbine is a perennial, herbaceous plant; its prominently branching stem is sparsely hairy and grows from 1 to 2 1/2 feet high. Both the basal and lower stem leaves are shaggy-haired underneath and biternate, with the leaflets or ultimate segments broadly wedge-shaped. The nodding blue, purple, or white flowers grow at the ends of the branches during the summer. Their 5 petals have characeristic nectar-containing, backward-projecting spurs about 3/4 inch long. Bloom in May. Originally came from Europe to be naturalized in the eastern United States. In moist, rich woods, wet, shaded rocky outcrops. Southern Canada southward. A decoction of the root helps stop diarrhea. The flowers taken with wine promote perspiration, and the seeds with wine are said to speed the delivery of a child, opens obstructions of the liver, good for jaundice, relieve kidney stones. Leaves are sometimes used in lotions to soothe sores in the mouth and throat. A lotion made from the fresh root is rubbed on the affected area to relieve rheumatic aches and pains. Native Americans used minute amounts of crushed seeds for headaches, love charms, and fevers. Seeds rubbed into the hair to control lice. Root chewed or weak tea for diarrhea, stomach troubles, diuretic. Root tea for uterine bleeding. Infusion: steep 1 tsp. plant parts in 1 cup water. Take 1 tbsp., 3-6 times a day. Tincture: a dose is from 5-10 drops.